According to AccuWeather, people living in or travelling through portions of Virginia, West Virginia, Maryland, Pennsylvania, New Jersey, New York and New England can expect dangerous driving and walking conditions through Friday morning, even after the precipitation ends. Power outages top 300,000 as snow, ice storm slams the eastern US. 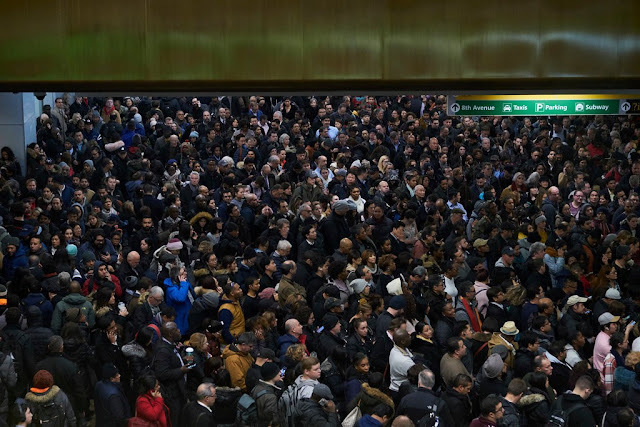 Port Authority Bus Terminal closed due to snowstorm overcrowding, see picture above, The Port Authority Bus Terminal was so crowded with commuters waiting for buses amid the massive winter storm that the agency blocked any more people from entering, officials said. According to WTOP, one unique aspect of the snowfall is how early it came to the region. Measurable amounts haven’t hit the D.C. area this early since 1996. According to Ricketts, there were only trace amounts on Nov. 13 and Nov. 26 in 2012. The last decade stands out like a sore thumb! It has had 29 major impact northeast winter storms with NO previous 10-year period with more than 10 storms! In Boston, 7 out of the last 10 years have produced snowfall above the average 43.7. Additionally, the trend for fall snow across the northern hemisphere has been increasing, defying the forecasts over the last two decades for snows becoming an increasingly rare event. The 10-year running mean of the Boston area snowfall has skyrocketed to the highest level since snow records were kept and that goes back about 145 years! Fluctuations in the temperature regime and annual snowfalls are a function of about 25 global factors including changing oceanic oscillations mainly sea-surface temperature anomaly locations which impact atmospheric conditions creating certain jet stream configurations plus others such as solar activity and irradiance, geomagnetic activity, volcanism, etc.